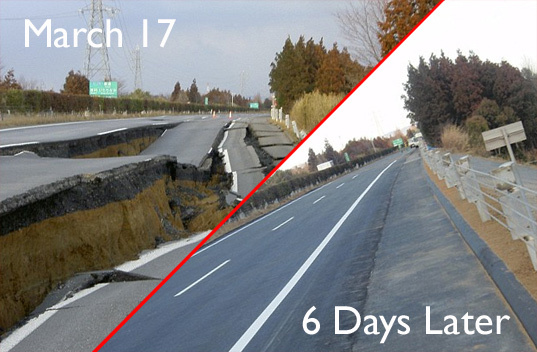 Six days after the earthquake and Tsunami hit Japan, construction crews started to repair this stretch of the Great Kanto Highway, in Naka, Japan. Six days after they started, the road looked like new. MONTHS after a bit of ice and snow in the UK, I’m still coming round corners and hitting bloody big potholes. And when you’re on two wheels, it’s more than a minor inconvenience or a suspension repair. It’s ‘kin SCARY. I know there’s a credit crunch, but if we’re going to get the country moving again we need decent roads! Original story found on Dvice. This entry was posted in News, Rants, Uncategorized and tagged Japan, rant, roads by crocodilejock. Bookmark the permalink.